Rachael Long has tri-county responsibilities in Yolo, Solano, and Sacramento through UC Cooperative Extension for conducting environmentally compatible research and education programs on field crops. 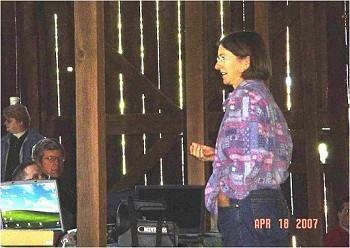 Her major emphasis is on forage crops (alfalfa, sudangrass, oat hay), and dry beans. Studies are also conducted on integrated pest management systems with disciplinary expertise in entomology and pest management and water quality. Her office is looking to develop an environmentally and economically sound systems approach to agronomic practices in pest management and sustainable agriculture. We are able to suggest alternatives to pesticides and new pesticide chemistries that will maintain the environmental and economic viablity of the production unit. This includes conducting surface water quality studies on non-point source pollution from insecticide use on field crop farms. Trials are in place to develop, evaluate and implement chemical and nonchemical approaches to pest management in field crop production, including biological control of crop pests. Our goal is to establish the most current and best management practices for pest control in the assigned commodities. We continually evaluate field crop varieties in regard to disease and insect resistance, yield potential, crop quality and other agronomic characteristics.